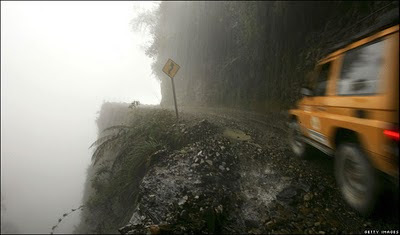 List of 11 most scariest roads to drive on. The North of Bolivia is considered to be one of the most horror zones. It is called “The road of Death“. Local people say it occurs because of some curse. More than 200 people lose their lives here annually. 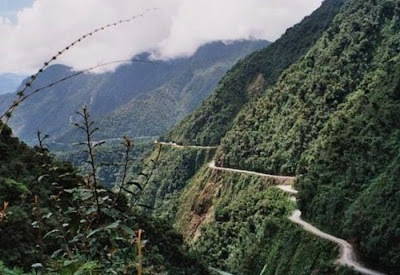 Though this road became a real Mecca for all Europeans, they think that the reason for so many deaths is not a curse but the thick fog and the location high up in the Andes. By the way, the fog is the reason for many car crashes all over the world but people who believe in ghosts and spirits like to think the accidents happen due to some mysterious cases. The most mysterious place, famous for its ghosts is, surely, British Isles. M25 direction is the most killing one. This road “eats” British cars and attracts crashes, but the police claim that the fog is the only reason for this phenomenon. Most skeptic men try to assure that there is a short list of reasons why accidents happen. And one of them is the high mountain location. 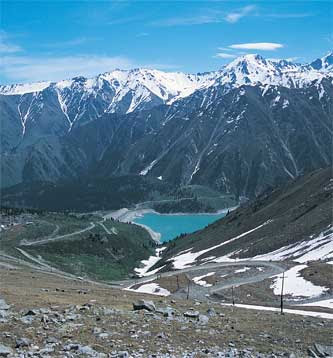 The Tien Shan road is quite beautiful and had the view of very peaceful place. It was built in 1977 in a form of windows in traditional Chinese style. But this line is often crowded with mountain rocks. Maybe, there is nothing to worry about but the lost lives and crashes, however, local people say the road was build in a wrong place. And gods were against it. Some places are not quite mystical and seem to have quite scientific explanation but again people say it is a true enigma place. Korean Jeju Island, had magnetic anomaly. It has an optical illusion, when you seem to go uphill and the vehicle moves to uphill without motor power. You lose the sense of balance in this situation and sometimes this may cause crashes. But Korean Peninsula is not the only place to possess such anomaly. About 60 km to the south of Rome the Via dei Laghi runs, a highway connecting Rome with wine region of Frascati and the Albanian mountains. Even the buses there with a crowd of people can roll up without engine. The gravity anomaly like this appears more and more in the world. But be careful as you must know where the end of the phenomena is. Russian road near Yakutsk cause crashes and death along many km of it. The locals say there is a burial place of White shaman who was killed. Right after the death people started hearing sounds of burial place. There were cases when people stayed near that place because engine suddenly stopped working. But believe it or not, after leaving metal stuff near the grave motor began working again. But these were very happy people. Some unlucky motorists couldn’t manage the car controlling. A town in Finland Kylama has a sign “Be careful, the UFOs” on its road because many passengers remained alive said before accidents they had seen the UFO. The line between Gairanger and Grontly has almost the same sign “Be careful there are the ghosts“. Many crashes appeared here for drivers saw dead people, children, shades. The direction between Mbarara-Ishaka, Uganda, has quite a mystical story. 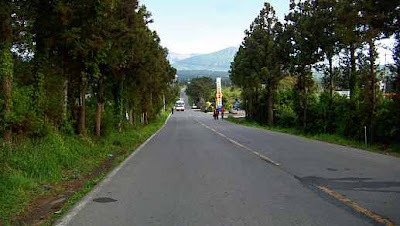 After the first part of the road was built the accidents appeared one by one. Police said the crashes happened because of alcohol. But after the famous preacher died in the next accident the local witch make a ritual of spilling cow blood on the road and the engineers had to put new asphalt. After the ritual, crashes had stopped. A similar case occurred in New Jersey, Deptford. Building of the road Num. 55 had faced many problems after a local Indian Karl Pierce asked to build it in another place for the road is passing through the old Indian graveyard. But after the authorities hadn’t heard him and completed the construction, many crashes took many lives. Karl says it will continue happening until the road is taken to another place. The motorists in Essex, England try to move very fast when passing near a rock on the edge of the road. The old Celtic legend says the stone is the home of daemon and he causes many deaths to those who want to stay near it. Indeed many wrecks occurred near this stone. The English scientists to study this phenomenon say that they really felt some mysterious quakes on this absolutely smooth road. Possibly the most mysterious road is located in New Mexico, Albuquerque. People avoid driving here. They believe this road swallows the whole vehicles and passengers. More than 20 men have already gone there. The Guoliang Tunnel in Taihang mountains in China is 1,200-metre-long tunnel which is about 5 meters high and 4 meters wide. 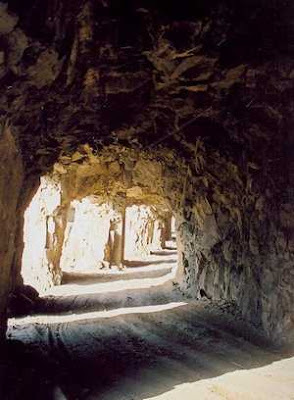 The wall of the tunnel is uneven and there are more than 30 windows of different sizes and shapes. In the early 80’s a new road was started between Wellington and Oakland. But during the next months it has become a true epicenter of wrecks and crashes. 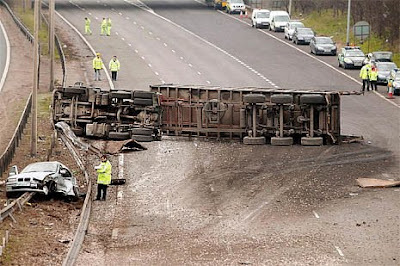 97 cars had got accidents there. And every second tragedy happened when the car was passing post No. 111. The most tragic day was on November 4th, 1988, when 9 cars crashed near the post. The scientists thought that the reason was some strange radiation. But one man before his death said when driving along this road he felt a wish to commit suicide. Most people who remained alive also claimed the same. 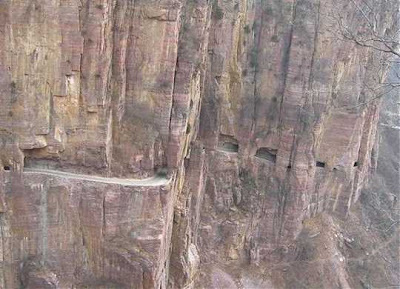 Those are the most dangerous roads I have ever seen!!! I would imagine they are for some crazy sort of leisure adventure driving!! !